"As a motorcyclist who plans to spend countless hours on two wheels this season, it's safe to say I've found my new favourite book." "Bosworth and Sanders' writing style is easy to read, engaging and witty. They have aimed these books squarely at pavement warriors and have succeeded in producing the best road guides available; bibles for seeking the finest roads in British Columbia and Washington State. As indispensable as a good credit card and sticky tires." Want to buy DHBC DHWA and/or DHNorCal? "I bought the DHBC book when it was recommended by a fellow rider on a BC Ferry on my first trip to BC. I was impressed with how the book was designed and how the info was provided. I was really impressed when I returned to BC the second time to travel those roads I missed the first time. I've since dog-eared this book making two more trips to BC and sharing it with my buddies. To travel BC without your book would not be wise, in my opinion, because you'll miss too much. It really has doubled my (our) riding pleasure." "I love DHBC. My friends and I are in awe of the roads we have taken... we took DH5 to DH2 and were absolutely amazed at the fun and beauty these routes provided"
" ...and your little phrase 'Ride like a local, not like a tourist' "
" ...and they go, 'But I live here, I am a local.' "
" Yeah, and you don't know how to get to these places (roads)! " "This is an impressive book...the Ulysses of guide books, a pound and a half of maps, stories, arcane and sometimes humorous facts, indexes and qualitative ratings... rides are described intimately, as if they had stopped after each curve, dug out notebooks and held detailed conversations...Even the Glossary of Twisted Terms is amusing: if you've never heard of "twistosterone" you need to get yourself some...as in the BC book, maps are printed for easy use in low light. There are a lot of maps, by the way, and they are very good maps... You can see where the money went: spiral-bound, full-color, printed like an art book and exhaustive detail." "Donut Hole: (n) that part of a Krispy Kreme with no pastry or that part of central Washington with no curves." That's from the Twisted Terms Glossary at the front of Brian Bosworth's and Michael Sanders' latest foray into moto-publishing: the highly entertaining, gorgeously produced, 542-page bikers' guide... they nailed it first time out (with DHBC), and promise to do so once again with this fully mapped and rated guide to the most scenic twists and turns in Washington State. I can attest to the accuracy and usefulness of Bosworth and Sanders' rating system. 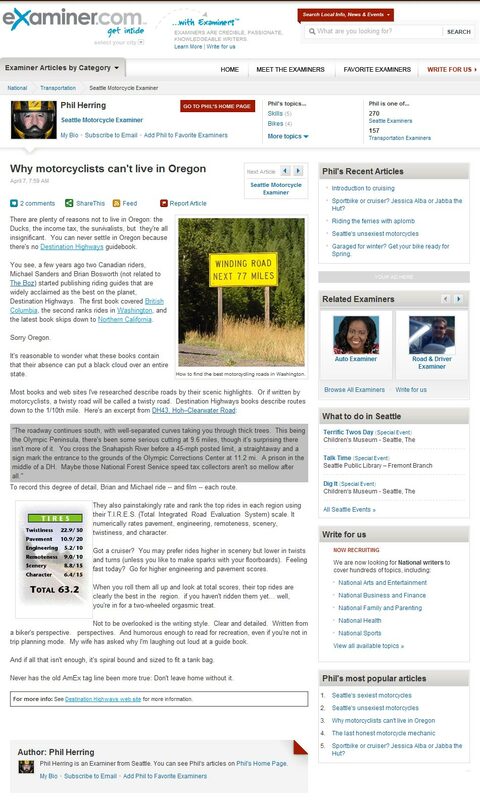 Their top-rated road (in Washington) was one of my peak experiences last summer." "Thought I'd let you know I'm in love with DHWA! I won't loan it out to anyone for fear it will get lost or damaged. I live just north of Seattle, and me and my BMW love the TEs you've found for me in my own Snohomish County backyard!" 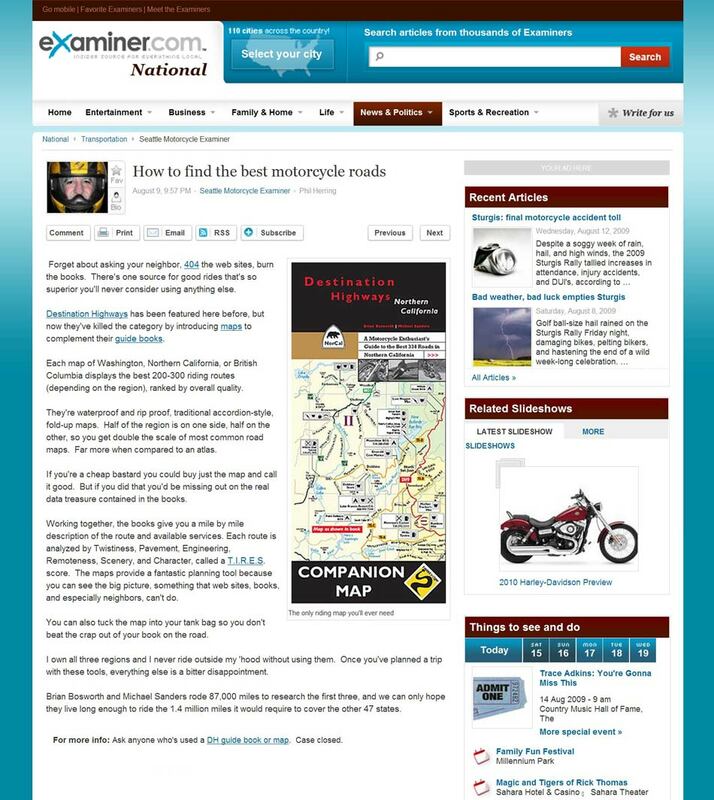 "I've just acquired DHWA and see they've continued, and added, to their very credible sharing of knowledge for motorcyclists, or really, anyone looking for adventures on the road. I'm a Washingtonian and have travelled many of its roads. Going through this book has shown me where I've failed to take the road less travelled. I'm thankful these surprises are there as I was initially dubious about spending money for info I thought I may have already had." large map (double scale) is so, so good for this." "I used DHBC & DHWA and they made the riding much more interesting and exciting!" "I was shocked at the level of detail I found in your NorCal epic. Your stuff is astoundingly informative and entertaining––absolutely top-notch." "The best motorcycle road reference books ever published. I own all three books and love them. I look forward to DH Oregon...or any other DH book they publish!" "IT ROCKS! DH NorCal is their third book and these guys thought it through. Extremely useful knowledge and made the grade on the ride as well. It took a few maps to get all the abbreviations down, but not too long and once you got 'em... no problem. An amazing book and worth the scrilla ($$$). Over 550 pages of moto heaven!" "The only problem I have with DH NorCal is that in looking at the roads that I know, I see all the others, the ones waiting for me, calling, demanding that I pay them a visit. Travel guides can be pure torture at times. Especially good ones like this". "The Destination Highways books have always been a fun read in preparation for riding season and an invaluable resource on the road." "DHNCA is absolutly fantastic! Have taken two trips with it and have ridden some of the best twisty roads I have ever ridden. I would have never found them without this book!" We particularly want your feedback on our books so we can improve our next book. What do you like or don’t like? What did we leave out? What do the books have that you don’t need? What should we add, and what should we take out?